I know some single men who are very self-absorbed. They are successful professionals but cannot seem to take their female relationships to the next level: marriage. They see the world through their own eyes and the older they get, the more rigid they become, increasingly unwilling to understand that women also have needs, which do not always revolve around men. For example, a 50 year-old friend has finally decided to get married because he wants children. He assumes that a 35 year old woman will want to marry him and have kids. He does not comprehend that a 35 year old woman generally is not interested in a 50 year old guy, yet he persists in his quest to find a young bride. 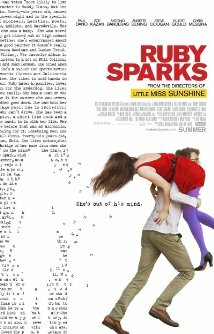 I thought of this unrealistic mindset of my friend as I watched Ruby Sparks, a clever, funny, profanity-laden, and very insightful film about relationships in which the male partner always sees things from his perspective and fails to understand the needs of significant others in his life. Calvin Weir-Fields, a young J.D. Salinger, has writer’s block after his first wildly successful novel. Visits to his therapist are helpful, but his inability to write persists, until something amazing happens. A girl, about whom he has been dreaming, becomes a real person and he falls in love with her. Improbable as it may seem, they date, dance together, and get to know one another as lovers and friends. The conceit that informs the movie is that Calvin can control Ruby by writing about her. She is both real and a figment of his imagination. It takes a while for him to process this conundrum, but he does when other real people such as his brother and his parents are able to actually see her and talk to her. There is no rational explanation for what happens, but the film manages to say some wise things about relationships between men and women. Consider these interchanges in the story. When Calvin, a loner, confides to Ruby that she is all he needs, Ruby responds “That’s a lot of pressure.” When Calvin feels depressed after Ruby leaves him for short time, he retires to his study and types that Ruby is miserable. Sure enough, she immediately phones to tell him how much she misses him. When Ruby desires to stay close to Calvin and physically cling to him, barely allowing him to breathe, Calvin again goes to his typewriter and types that Ruby is “filled with effervescent joy.” This makes Ruby perpetually bubbly and unresponsive to the nuances in Calvin’s behavior. The relationship reaches a dramatic crescendo when Calvin exerts his power to control Ruby in an almost diabolical way, mercilessly informing her of his power to control her. It is an extraordinary scene pitting the controlling male against the defenseless female. How this problem is ultimately resolved is the stuff of fancy, but along the way we glean wisdom about what the relationship of a man and woman should be. Jewish tradition has much to say about the relationship between men and woman. Every Friday night, the traditional Jew sings an ode to the “woman of valor” described in King Solomon’s Book of Proverbs. She is independent, wise, and the key to passing down tradition to her children. In a Talmud class, a student once asked the teacher: “How can I get my wife to treat me as a king?” The answer from the teacher: “Treat your wife like a queen and she will treat you as a king.” The answer reveals the mutual respect that husband and wife should have towards one another. The issue is not one of control. Rather the relationship should be characterized by each partner giving to the other. The goal of marriage is not to control or change the other; rather it is to lovingly accept the divinity within each other so that there will be mutual respect for one another’s uniqueness. Posted in Comedy, Drama, Movie review, Romance, Science Fiction. Bookmark the permalink.